Breezy Hill consists of two separate homes. The Main House and the Guest House. Read more about both of our properties under "Facilities and Rates." Both homes feature FREE WIFI access 24/7, satellite TV, and we provide a VONAGE phone at no extra charge, which allows guests to make or receive calls from the U.S., Canada, and several European countries. These homes have a ‘GLORIOUS SUNRISE VIEW’ of the aqua blue waters of Exuma. Our homes have been recommended by Tripadvisor, The Bahamas Tourism Bureau, Emerald Bay Marina, Don’s Auto Rental, Airport Auto Rental and countless company executives and many foreign visitors from all over the world that we have hosted for the past sixteen (16+) years. Please check out our TripAdvisor page to read our reviews by previous guests who have now become our friends. 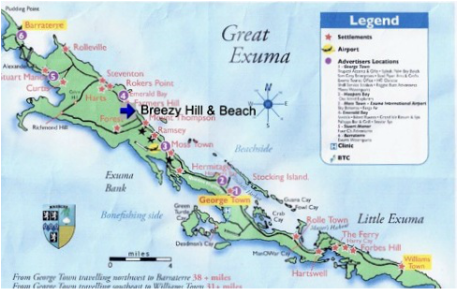 ‘Breezy Hill’ is located 4 miles from the airport and 4 minutes from the Sandals Hotel at Emerald Bay on Great Exuma, Bahamas. There are food stores, restaurants and even a TIKI BAR on the beach nearby for your evening entertainment! We have been on Exuma for more than 35 years, and we can help direct you to the best beaches, restaurants, daily boat rentals, and fulll-day excursions that will help to make your vacation a memorable one. Our rates are VERY AFFORDABLE, with good reason. We want families, young and old alike to have a ‘GREAT EXUMA’ adventure! 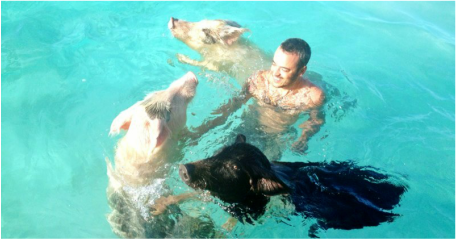 Come SWIM with the pigs!